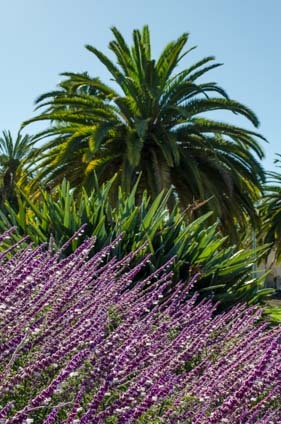 Fall, 2013 – Living on San Diego’s beautiful shores is a true delight, not only becuase there is always so much going on, but because it is so close to all that San Diego has to offer. 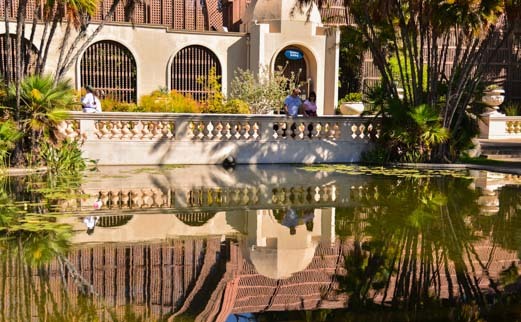 One of the prettiest places in the city is Balboa Park, and we enjoyed several wonderful excusrions there. 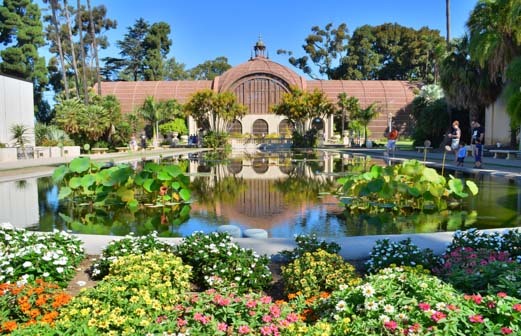 Balboa Park is a big city park filled with all kinds of flora and fauna along with several miles of hiking trails. 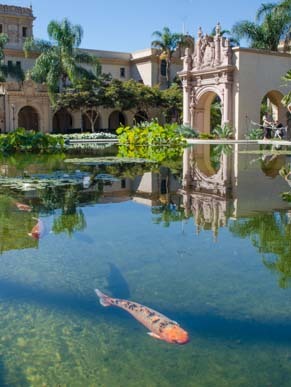 Perhaps the most lovely area is around the koi fish pond where there are some beautiful old buildings and some very colorful koi fish swimming just below the surface. This is a great place to take a stroll and soak in a little sunshine and relaxation. Of course, it is a city park and, on the day we were there, a fellow was spouting bible verses and personal philosophies at very high volume, echoing his thoughts about life off the walls of the stone building at the top of his lungs, pontificating to anyone that would stop and listen. I listened for a few minutes but couldn’t make heads or tails out of what he was saying! However, the water was utterly still, and as clear as could be, creating lovely reflections. 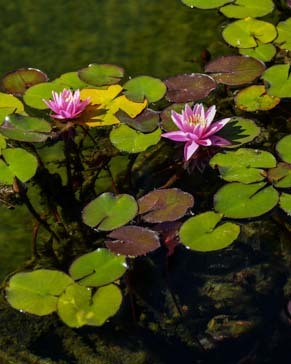 The pretty lilies floating between the pads seemed to smile up at the world. 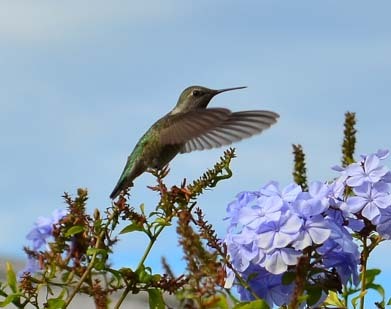 A hummingbird flitting between the many flowers added his own buzz to the air. 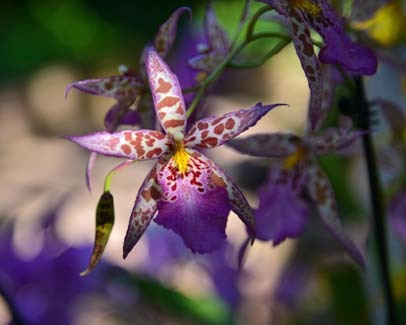 A beautiful indoor botanical garden fills one of the buildings near the koi fish pond, and a meander through there took us past all kinds of exotic flowers. This reminded us so much of our extraordinary visit to the orchards and gardens of Hagia Sofia near Huatulco, Mexico last winter. We both contented ourselves for quite a while taking photos of the colorful display. 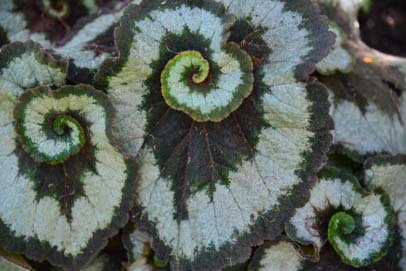 There is a kind of romance to the area, and we both had to laugh when we saw several plants that had leaves shaped like swirling hearts. 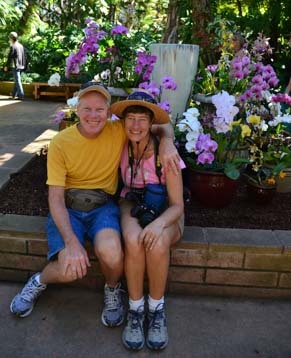 We were happy when someone offered to take a picture of us amid the orchids!! Other people hired professional photographers to take their portraits around the beautiful grounds of Balboa Park. Professional photographers were taking portraits everywhere! We admired more than a few professional camera setups, with big flashes, lighting umbrellas, enormous lenses and teams of assistants helping out. And more than once we turned a corner to see a portrait shot that would soon be framed. 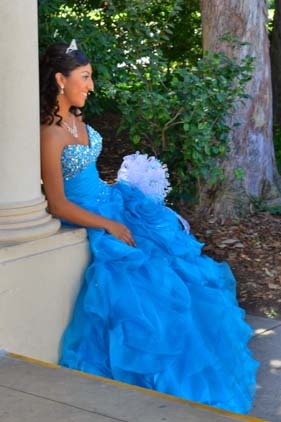 We even saw a young Mexican girl in the midst of a Quinceañera photo shoot, all dressed up for her special 15th birthday party. This was like so many others we had seen in Mexico, especially in Ensenada and Morelia. 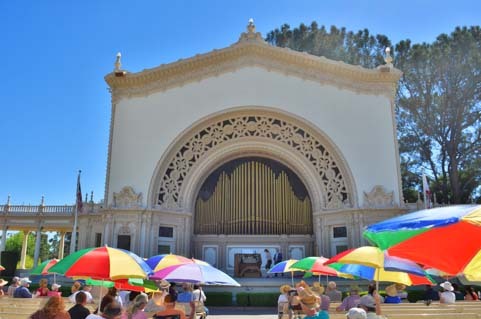 One of the most unusual attractions in Balboa Park is the enormous outdoor organ. 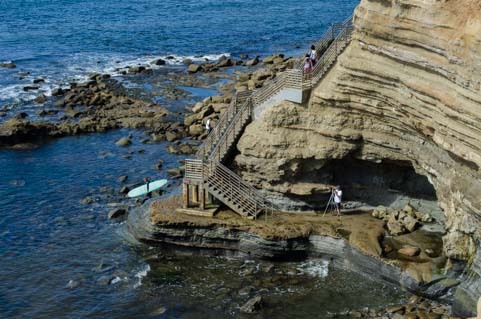 When the organ was donated to the park by John and Adolph Spreckels in 1914, the one stipulation was that it be played for outdoor concerts, and since 1917 San Diego has had a civic organist who performs free weekly concerts on Sundays. While we were there a small audience gathered in front of the organ, taking shade under colorful umbrellas. Before long, the enormous rolling door opened to reveal the huge organ pipes. The 4500+ pipes range in size from as small as a pencil to as big as 32 feet high! A woman walked out on stage and began an hour-long concert. 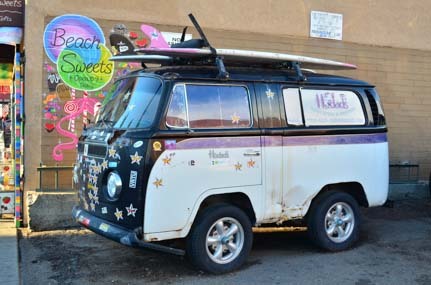 The hostel at Ocean Beach – Peace Baby!! Wow. That is quite a musical instrument! Unfortunately, she chose some really chaotic sounding modern music to play, and as we walked away we could hear the cacophany of clashing chords far into the corners of the park. Oh well. We’ll have to return on another day when the performer chooses something a little more melodic and soothing!! Balboa Park is situated right downtown. 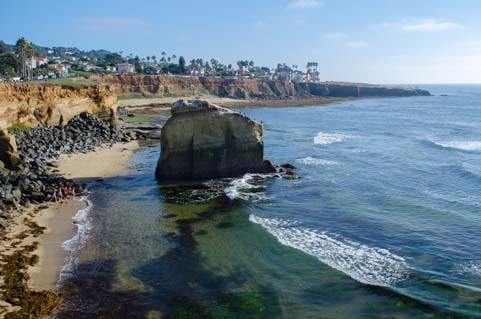 To the north of the city there are several big beach communities, and one of the most notable is Ocean Beach, a hippie seaside town that has decided to remain firmly planted in the 1960’s. 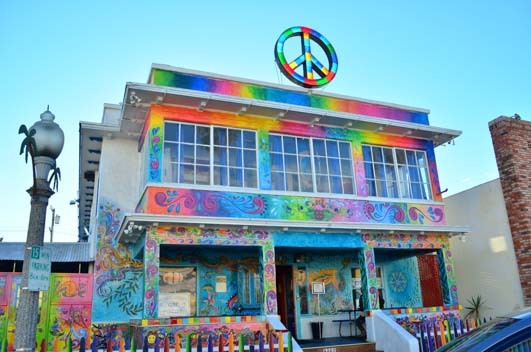 The prominent hostel is painted a kaleidescope of groovy colors and sports a big peace sign on its rooftop. Walking down the street, the smell of patchouli incense wafted out of the doorways of several head shops. Oddly, this wasn’t a town of pony-tailed grey-hairs who used to be hippies in their youth, but instead was loaded with younger folks who are embracing the hippie way today. Even though Starbucks has come to town, we noticed that the only identifying feature on the outside of the building was the circular green logo. Down an allyway, Mark spotted a tumble bug. Far out! California has such a great car culture. 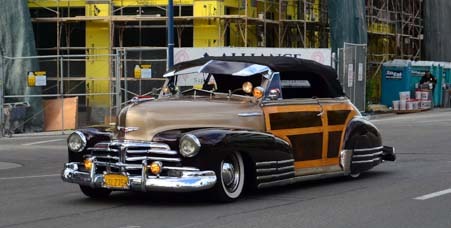 Something exotic always seems to be cruising past, and I just barely caught this low-riding woody as it sped by. One day we had a chance to try out cruising of another kind. The local Hobie dealership hosted an open house, and all their water toys were lined up at the docks. We could try out anything that seemed appealing! 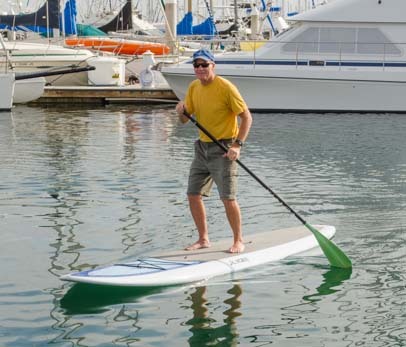 We’d never tried standup paddle boarding before, and we both got a big kick out of it. 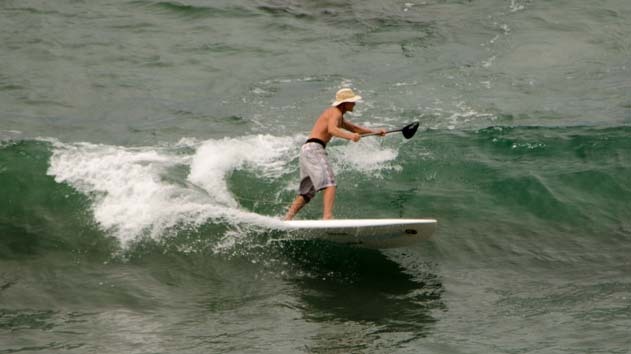 A few days later at nearby Torrey Pines we watched a really skilled stand-up paddle-boarder carve through the surf. So that’s how you do it! 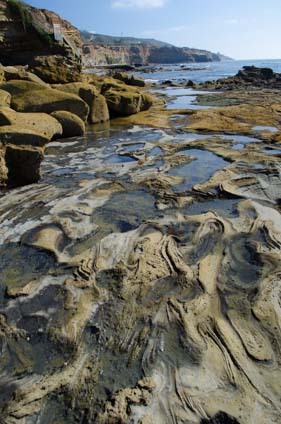 Sunset Cliffs is a series of craggy cliffs nearby, and we scampered over these rugged rocks to check out the tidepools one afternoon. This is a photogenic area, and there were photographers everywhere trying to capture the beauty. As we climbed down the endless stairs at one viewpoint, a pair of young photographers with mammoth cameras and lighting gear were coming up the stairs towards us. Tucked between the two of them was a young barefoot woman with a bare torso and bare legs. She was clutching a woolly sheepskin to her chest. As we got closer, it didn’t look like she had much clothing on besides this piece of sheepskin. Sure enough, after she passed us we noticed there was nothing covering her backside! 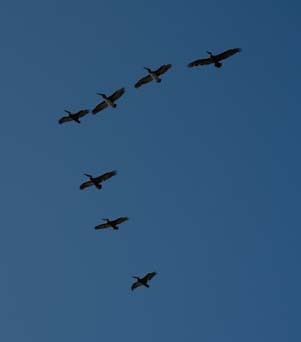 We stuck to photographing Nature itself and looked up to see a group of pelicans flying in formation overhead. Well, not everything around here was pure nature. As the pelicans disappeared over the horizon, three Navy helicopters flew in formation in the opposite direction. Sunset Cliffs is beautiful in broad daylight, but the place really comes to life as the sun begins to drop out of the sky. The cliffs face west, and just before the sky begins to turn colors, cars begin to arrive and people begin to mill around the edges of the cliffs to take in the sunset. Some couples bring chairs or stand close to each other and stare off at the horizon. Some folks take out their cameras and wait for the magic moment. And a few others do yoga and tai-chi moves. However it is that they all say goodbye to the day, there is a shared awe and respect among everyone at the cliffs’ edge as they look out over the ocean to watch the sun’s light show and welcomes the arrival of night. We are rewarded with a humdinger of a sunset! As fall slipped towards winter, we had been living in San Diego aboard our sailboat Groovy for four months. 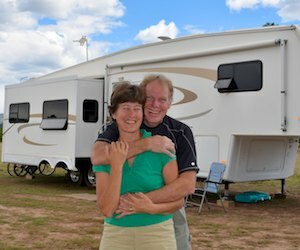 Much as this beautiful city and lifestyle enchanted us, our eyes were now turning towards our new land-based life that would soon begin 350 miles inland in Arizona.